For complete details of how this card was created,please visit my blog 'Nellies Nest'. Be sure to leave a comment both here on this SNS blog post and then head on over to my personal blog and leave a comment there as well for your chance to win a $20 gift card to SNS! One lucky winner will be chosen from one of the Designers' posts on the last day of each month. A comment must be left on both the SNS Blog and the Designer's post in order to qualify. The winner will be announced on the 3rd of the following month, both on the SNS Blog and on the SNS Facebook page. Beautiful layering and colors! 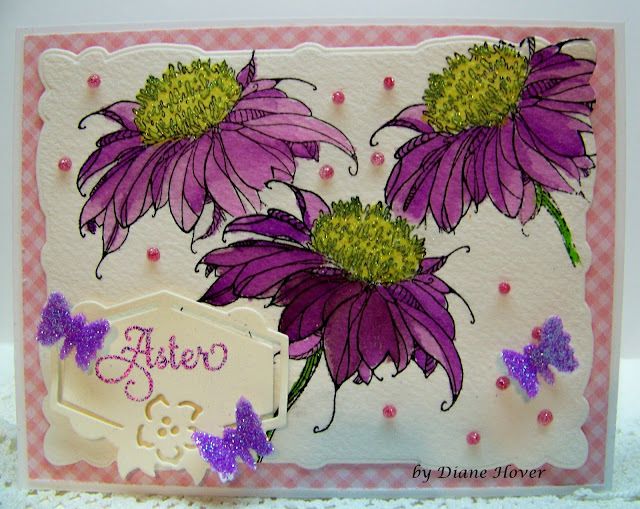 Love these pretty asters and the sparkle in the yellow centers! You have really done that stamp justice. I love your rich colors, and the watercoloring is perfect. Wonderful design too! !